Baker Donelson is deeply saddened to announce the passing of Lewis Donelson, senior counsel and co-founder of the Firm. Mr. Donelson, who was 100 years old, died on January 4, 2018. A native Memphian, Mr. Donelson began his legal career in 1941 after earning his law degree from Georgetown University Law Center. In 1954, he founded the Memphis law firm of Donelson & Adams. His vision was to create a full-service firm with broad scale expertise. More than 60 years later, that vision has been realized in what has grown to become the 57th largest law firm in the country with more than 700 attorneys and public policy advisors in 22 offices across 10 states and in Washington, D.C.
"Lewie Donelson dedicated his life and career to outstanding service to the legal profession and his community," said Ben C. Adams Jr., chairman and chief executive officer of Baker Donelson. "In a career that spanned more than 70 years, Lewie's leadership and activism had a lasting and far-reaching impact. While we're extremely saddened by his passing, we're proud to be a part of Lewie's legacy and are committed to carrying on the spirit of dedication and community that he exemplified and that is at the core of the culture and personality of Baker Donelson." Co-founding one of the largest law firms in the country was just one of many notable achievements in Mr. Donelson's legal career. In his practice, which focused on corporate and tax law, he formed the first professional limited liability company in Tennessee and established some of the earliest private pension and profit-sharing plans. He won one of the first family partnership tax cases, a leading case involving the taxation of cotton futures trading and hedging, an early case involving multiple corporations, and many others. Mr. Donelson also played a key role in increasing funding for rural schools when in 1988 he represented a group of 77 rural school systems in Tennessee Small School Systems v. McWherter, et al. The lawsuit was filed to force the State of Tennessee to fund its public schools in a more equitable manner so that children from poorer districts would have the same opportunity to receive a quality education as children from more privileged districts. The case eventually reached the Tennessee Supreme Court, which in 1993 unanimously ruled that the state's education funding system was unconstitutional. As a result of the case, state lawmakers created the Basic Education Program (BEP), an education funding formula designed to be fairer to counties with smaller tax bases. Beyond his legal career, Mr. Donelson is also widely known for his lifelong political involvement at the local, state and national levels. In 1954, shortly after the Brown v. Board of Education decision, Mr. Donelson served as a member of the newly formed Shelby County Community Relations Committee, which was established to arrange the peaceful integration of all public facilities in Memphis. In 1967, he was elected as one of Memphis's first councilmen. He is frequently credited with helping build the Tennessee Republican Party, effectively creating a two-party system in a city that had long been held under the control of "Boss" E.H. Crump, the Democratic mayor of Memphis who controlled all of Memphis politics as well as much of the state's politics. He served on the Republican State Executive Committee from 1964 to 1974, and served as a member of the Platform Committee at the Republican Convention in 1968 and as a delegate of the Tennessee Constitutional Convention in 1971. From 1979 to 1981, he served as Commissioner of Finance and Administration under Tennessee Governor Lamar Alexander. He was active in Republican campaigns from 1956 until 2006 and served as chair of many campaigns, including the 1978 re-election campaign for Senator Howard Baker. In 1994, Senator Baker's law firm, Baker Worthington, would merge with Mr. Donelson's firm to form Baker Donelson. Mr. Donelson also played an active leadership role in the community, giving his time and energy to numerous organizations. He served on the boards of St. Jude Children's Research Hospital and the National Rural Schools Trust, and served as chair of the National Advisory Council for The Hermitage, the home of President Andrew Jackson. 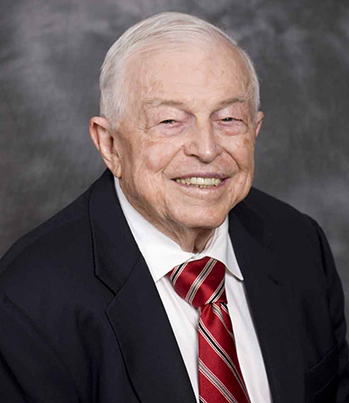 He served as president of Travelers Aid in 1945, as president of Shelby United Neighbors, predecessor to the United Way, in 1961, as a member of the Tennessee Higher Education Commission from 1982 to 1992, and served as chair of the Regional Medical Center in Memphis from 1996 to 2006. Mr. Donelson earned numerous accolades in recognition of his achievements and contributions. In 2012, the Memphis City Council honored him with the Memphis City Council Humanitarian Award, and the City of Memphis passed a resolution to name a street in his honor. That same year, he was also named the Memphis Bar Association's "Judge Jerome Turner Lawyer's Lawyer". In 2010, he was named by UNICO Memphis as the recipient of its Civic Award, which recognizes an individual who has demonstrated a lifetime of service for the betterment of the community. In 2006, Mr. Donelson, a former Scoutmaster and Life Scout, received the Distinguished Citizen Award from the Chickasaw Council, Boy Scouts of America, in recognition of an individual who has given service to the community, state and nation. Mr. Donelson authored Lewie, an informal account of his life and esteemed career in law, politics and public service, which was published in 2012. Mr. Donelson was preceded in death by his beloved wife of 65 years, Jan, who was his partner and inspiration throughout his life. Mr. Donelson is survived by his children Lewis IV, Janice and Loring, four grandchildren and one great-grandchild.